“The owner of any dam shall allow sufficient water at all times to pass over, around, or through the dam, to keep in good condition any fish that may be planted or exist below the dam.” California Fish and Game Code § 5937. The simple language of Section 5937 makes it one of the clearest laws in California. Versions of this law have been around since the 19th century and it was repeatedly strengthened until the present version became law in 1957. Section 5937 seems to provide clear protection for California fishes below dams. So why are we still wrangling over issues of how dams affect fish more than 120 years after the first version of the Code was written? The answer is simple. Dam owners had more clout than fishermen, so it was easiest for the Fish and Game Commission over the decades to just ignore the law, especially after being slapped down the few times that attempts were made to use it. Let’s look at the example of the San Joaquin River. Historically, the San Joaquin and its tributaries supported the southernmost Chinook salmon run in North America—of perhaps 500,000 fish. By the 1940s, water development in the basin and overfishing had reduced the run to 40,000-50,000 fish. 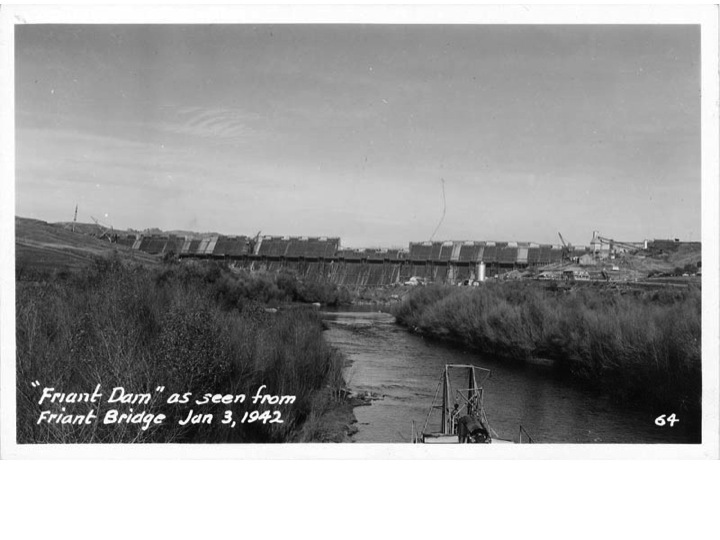 Then U.S. Bureau of Reclamation (USBR) built Friant Dam on the upper San Joaquin River to divert water for farming in the San Joaquin Valley and Tulare Basin. The dam closure and diversion of water from the river channel dewatered the river’s middle reaches except for a small section just below the dam. 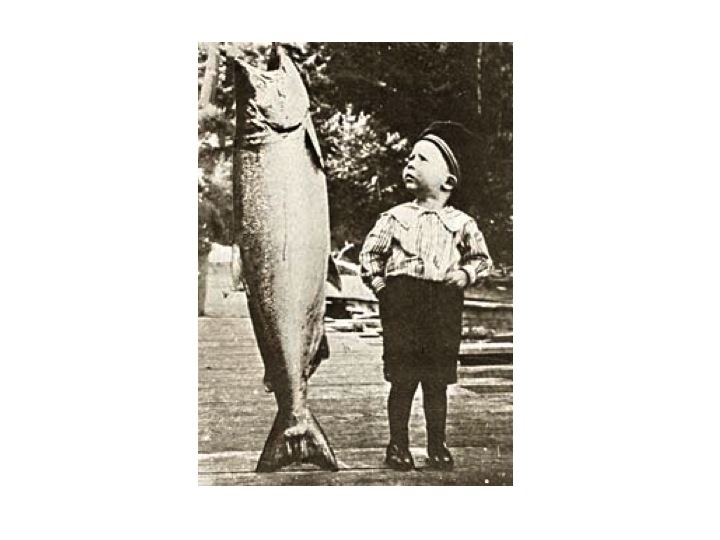 Within a few years, the remnant run of spring Chinook salmon was extinct because there was not “sufficient water at all times” below the dam to keep the fish in “good condition”—a clear violation of the Fish and Game Code § 5937. Attorney General Pat Brown declared in 1951 that Code § 5937 was advisory only and refused to allow the Department of Fish and Game to sue USBR to keep sufficient water in the river to support the fish. In addition to the extinction of salmon from the river, thousands of acres of riparian and wetland habitats were lost, and the river channel became reduced to a regional drain and flood channel, contributing to degradation of downstream water quality. Finally, in 1988, a coalition of environmental groups, led by the Natural Resources Defense Council, filed a lawsuit challenging the right of USBR to continue operating Friant Dam without providing water for fish, especially salmon (Natural Resources Defense Council v. Rodgers). After 18 years of squabbling in court, the parties reached a court-ordered settlement agreement in 2006 with two major goals: 1) restore and maintain fish populations in “good condition” in 150 miles of the San Joaquin River down to its confluence with the Merced River; and 2) minimize loss of water to long-term water contractors affected by the settlement. The federal and state governments appropriated about $400 million to restore lost river channels and provide infrastructure to reduce effects of the settlement on irrigators. 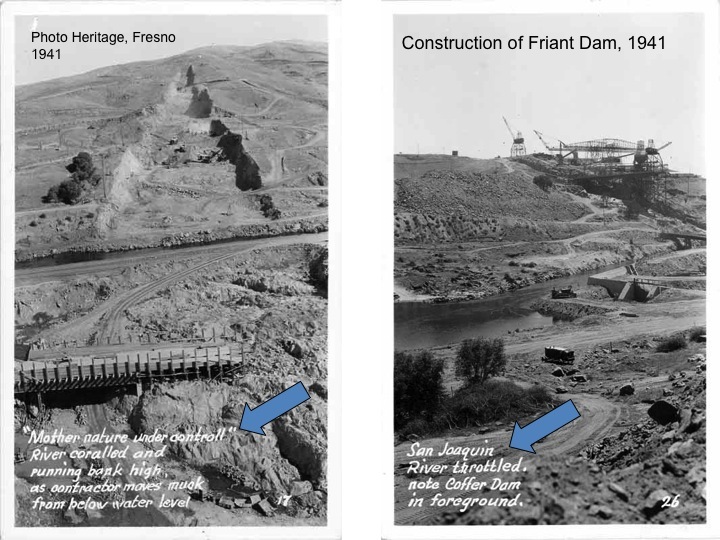 In his 41-page decision, U.S. District Judge Lawrence K. Karlton wrote that before the dam, "So many salmon migrated up the San Joaquin River during the spawning season that some people who lived near the present site of Friant Dam compared the noise to a waterfall. Some residents even said that they were kept awake nights by the myriad salmon heard nightly splashing over the sand bars in the River. 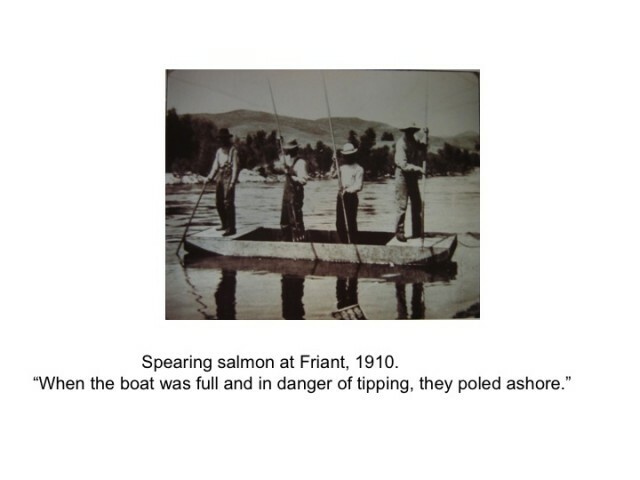 A fisherman who lived downstream recalls that, in the 1940s, the salmon were still 'so thick that we could have pitch-forked them. One almost could have walked across the River on the backs of salmon when they were running.'" The settlement established an ambitious schedule to restore Chinook salmon runs and reestablish other fish in the river. The first experimental restoration flows were released from the dam in 2010. Under the supervision of a restoration administrator, Rod Meade, major planning efforts are well under way for a range of activities, including determining the environmental flow regime, designing new diversions and channels, and choosing stocks of fish for reintroduction. The first salmon are scheduled for release by December 31, 2012. The post-settlement process has been highly contentious, but progress toward settlement goals is being made. The settlement illustrates the potential of a lawsuit-disciplined consensus process to resolve important water management issues, as well as the ability of state laws and policies to “nudge” changes in federal water project operations. However, the restoration efforts are now in peril because of a provision inserted by Rep. Devin Nunes (R-Visalia) in the 359-page federal spending bill, approved by the House of Representatives in February 2011. Rep. Nunes’ measure would essentially reverse current settlement processes by removing all funding for the San Joaquin settlement agreement. The fate of this measure within the spending bill remains to be seen. Ironically, even if Rep. Nunes’ measure is successful, it is possible that the legal agreement could still result in the release of water from Friant Dam for salmon, only without the protection for farms the funds would buy. Section 5937 is an old, tested, and clearly written state law that applies to all dams in the state unless they are specifically exempted. In the San Joaquin case, water users got a free pass from the law’s enforcement for over 60 years. By signing the settlement agreement, the Bureau of Reclamation, the participating water districts, and the farmers they represent all recognized that it was finally time to live within the requirements of the law. Water will flow down the San Joaquin again one way or another, creating a living stream for fish, wildlife and people to enjoy. Once everyone in the valley gets used to the idea of a living river in their backyard, most will wonder why it took so long to get the water flowing again. Fish and Game Code § 5937 is a powerful fish and stream protection law and will likely be increasingly used to help reconcile human activities with protection of fish and their ecosystems. Indeed, application of § 5937 to achieve ecosystem reconciliation might allow at-risk fish species to become abundant enough to avoid being listed as endangered species, or even to be delisted, through careful management of regulated systems where restoration to more ‘pristine’ conditions is an unrealistic goal. KQED radio’s Forum show on February 18 focused on Delta issues and discussed Congressman Nunes’ proposal in the House to budget to block Endangered Species Act protections for the Bay-Delta. Baiocchi, J. C. (1980), “Use it or lose it: California Fish and Game Code 5937 and instream fishery uses,” U. C. Davis Law Review 14:431-460. Firpo, R. (2005), “The Plain “Dam!” Language of Fish & Game Code Section 5937: How California’s Clearest Statute Has Been Diverted From Its Legislative Mandate,” Hastings W.-N.W. Journal of Environmental Law and Policy, vol. 11, issue 2, pp. 101-120. Marchetti, M. P., and P. B. Moyle (2001), “Effects of flow regime on fish assemblages in a regulated California stream,” Ecological Applications 11:530-539. Matthews, N. (2007), “Rewatering the San Joaquin River: A summary of the Friant Dam litigation,” Ecology Law Quarterly 34:1109-1135. Moyle, P. B. (2002), Inland Fishes of California. Revised and expanded. Berkeley: University of California Press. 502 pp. Moyle, P. B., M. P. Marchetti, J. Baldrige, and T. L. Taylor (1998,) “Fish health and diversity: justifying flows for a California stream,” Fisheries (Bethesda) 23(7): 6-15. Palmer, T. (2010), Rivers of California: natures lifelines in the Golden State, Berkeley: Heyday Books, 186 pp. Rose, G. (2000), The San Joaquin: A River Betrayed, Clovis Ca: Quill Driver Books. 150 pp. Schmitt, M. (2010), Workshop presentation to the State Water Resources Control Board, Natural Resources Defense Council. Warner, G. (1991), “Remember the San Joaquin,” pages 61-69 in A. Lufkin, editor. California’s salmon and steelhead: struggle for an imperiled resource, University of California Press, Berkeley. Yoshiyama, R. M., E. R. Gerstung, F. W. Fisher and P. B. Moyle (2000), “Chinook salmon in California’s Central Valley: an assessment,” Fisheries 25(2):6-20. This entry was posted in California Water, Fish, Restoration, San Joaquin River and tagged California, California Fish and Game Code § 5937, Chinook salmon, dams, fish protection laws, Friant Dam, Natural Resources Defense Council, restoration, San Joaquin River, San Joaquin Valley, U.S. Bureau of Reclamation. Bookmark the permalink. 3 Responses to Dammed fish? Call 5937.